Place the vegetables, bay leaf and pepper berries in a casserole dish, cover with plenty of water and bring to the boil. Add the veal, lower the heat and simmer until the meat is cooked and tender. Let the meat cool down completely. Add the tuna, mayo, anchovies and capers to a blender. Start to blend, slowly adding the wine and adjusting the flavour with lemon juice and salt if necessary. Once smooth, place in the fridge for later. 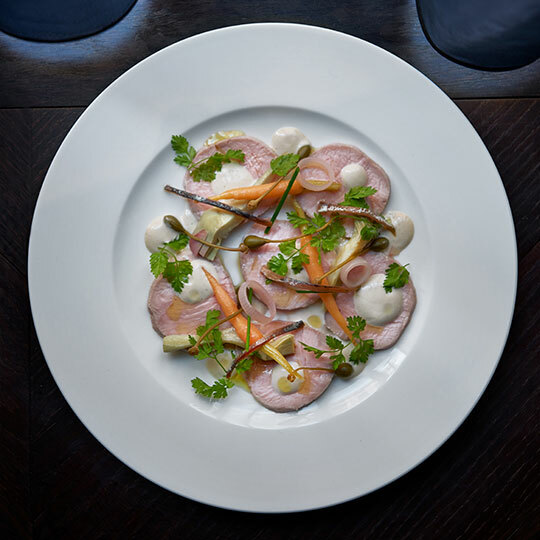 Slice the veal, season it with the tuna sauce and finish with the pickles, caper berries and some sprigs of chervil.